I may flirt with St Petersburg or cast a wayward eye at Belize but I always go back to Paris. Yes, Paris has seen better days. The mood is decidedly down and the only obviously growing business is begging. The streets are filled with striking [fill in the blank] and anyone with money is moving out. But today is St Valentines Day and I am here with my husband - in the city of light and l'amour - and as cities go, it is still a wonder. First, there's the Look - Every time we arrive - conveniently by Eurostar or less conveniently by car, in rain or sun or snow - the elegance and sheer beauty of the place makes us feel glad to be alive. Yes, every time. How many cities can you say that about? Food and Dining - We may complain that our old haunts aren't as good as they were or as we remember. We may talk endlessly about how restaurants are cutting corners and standards are falling and then we pop in to an old favourite like Aux Charpentiers (10, rue Mabillon Tel:01 43 26 30 05) near St Sulpice, a place that my mother-in-law frequented with relish 50 years ago and we still had a great lunch of stuff that sounds revolting and tastes divine. Tongue, calves feet and blood sausages and we are reminded that every French person considers every meal important and we sigh with envy. Shopping - I learned something new this trip. If you get caught in a demonstration, go shopping. I got caught on the wrong side of Boulevard St Germain during the teacher's strike and came home with the most fabulous set of sheets from Oliver Desforges that I had been eyeing for over a year. And here was my story: "I wouldn't have bought them but I was worried about the crowd getting out-of-control so I just ducked into a shop to be safe. You do want me to be safe, right?" And that was, dear Reader, the easiest justification for buying something I wanted but didn't need I have ever come up with. So if you are in Paris and the streets are full of demonstrators, you know what to do. Back to the future for culture - If you think you have done all the museums in Paris, my advice is start all over again. After 20 years of visiting, we' ve kind of achieved that status so this time we went back to the museums we last visited in 2005. We spent a blissful day at Jacquemart Andre and Nissim de Camando which were as fine as we remembered and even managed to visit a new one, the Musee Cernuschi, the City of Paris's Museum of Asian Art. 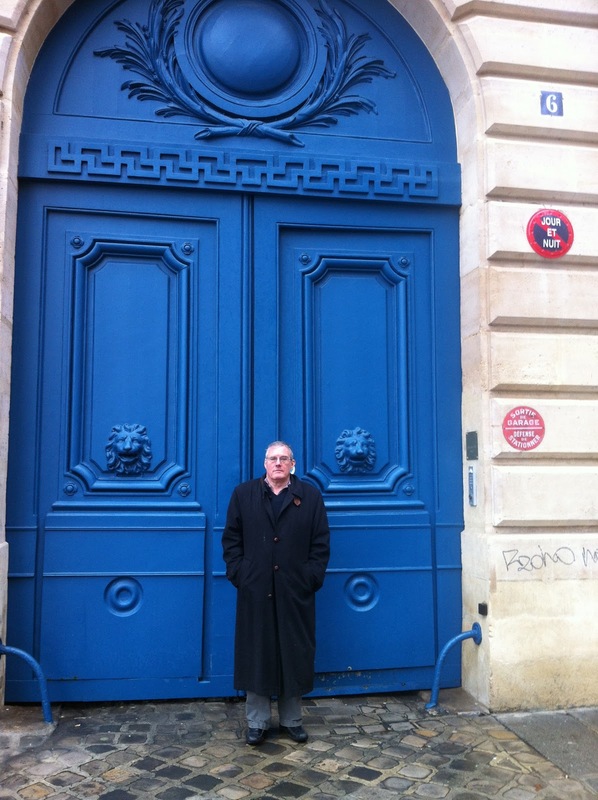 Eternal and invincible - The photo above is a picture of my husband standing in front of the building on Place St Sulpice where he lived as a little boy. The ground floor may now be an Yves St Laurent boutique but the view of the Place is essentially the same. Children still play by the fountain and run up the hill to the Luxembourg. No matter what happens in the short term, we'll always have Paris.